WINNIPEG -- With little surprise, the 2017 Volkswagen e-Golf is on sale in Ontario, Quebec and British Columbia, the three provinces that offer rebates of as much as $14,000 to buyers of electric or hybrid vehicles. More surprising is the specific mention of selling it in only one of the provinces without rebates: Manitoba. Bryan Romaniuk, sales manager at St. James Volkswagen in Winnipeg, said as soon as VW promised to have nine models of electric vehicles on the ground by 2025, his dealership knew it wanted to get ahead of the curve. “We want to be on the forefront of this,” he said. “Despite Manitoba [government] not being on board with rebates, we want to be on board. 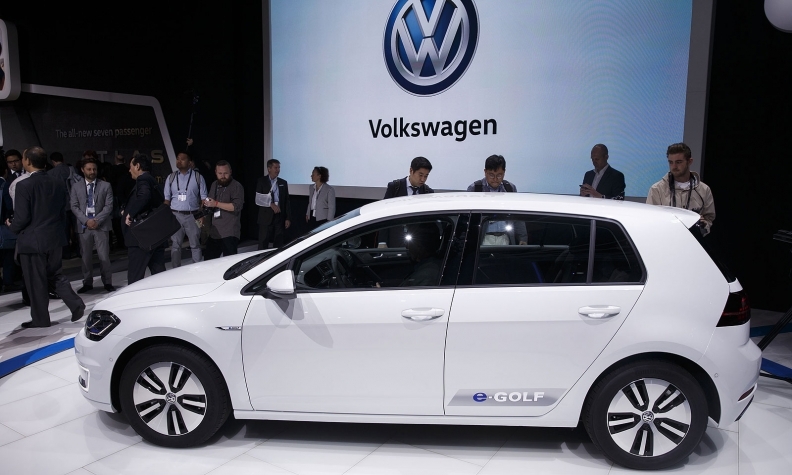 Romaniuk said the move requires $60,000 for two fastcharging stations, and the dealership will begin training its sales staff on the e-Golf as soon as the dealer information packages arrive. The e-Golf is priced at $37,640, including $1,645 freight, it has an estimated range of 200 kilometres, puts out 214 pound-feet of torque and reaches 100 km/h in 9.6 seconds. Thomas Tetzlaff, spokesman for Volkswagen Canada, said dealer response to the e-Golf has been strong. “The e-Golf was offered to all Canadian Volkswagen dealers,” he said. “For the initial launch, about half of them have signed up, including both Winnipeg stores,” but no others outside of Ontario, Quebec and B.C. Knight Auto Haus Volkswagen is also participating in the first wave, Tetzlaff said. Representatives of Knight Auto Haus did not respond to a request for an interview. Dealers in the first wave will begin seeing cars in June, while dealers who did not sign up for the first wave can sign up for the second wave, which begins early in 2018. The Nissan Leaf is sold in all provinces except Newfoundland and Labrador while the Mitsubishi iMiev is sold everywhere but Prince Edward Island – where Mitsubishi has no dealership – and Saskatchewan. The Ford Focus Electric is limited to the three rebate provinces for now. Robert Elms, president of the Manitoba Electric Vehicle Association, said news of the two Winnipeg VW stores jumping on the e-Golf bandwagon is evidence of Manitobans’ enthusiasm for electric vehicles. “Long before EVs were available for sale in our province, association members were converting internal-combustion vehicles to electric power,” he said. Elms said the first Canadian to buy a Chevrolet Volt was a Manitoban. Elms referred to comments by Audi America President Scott Keough in January that in the next decade, there could be 30 or 40 brands building only electric vehicles. “Clearly, the smart folks at St. James and Auto Haus were listening,” Elms said. He said the association is excited by the growth of the EV market, in particular VW’s pledge to build between two million to three million all-electric cars a year by 2025. “Electric vehicles are environmentally friendly, very inexpensive to operate and, because of their superior performance, a lot of fun to drive,” Elms said.